I just returned from my 1,786th trip to the mall in the past 3 days. We’re shooting the cover for my Girl Hunter book tomorrow at the crack of dawn in a beautiful location in upstate New York. It’s actually rather funny how I came upon the location… it entails a lovely German lady and me barging into an old mansion one late morning. But that story is for another day. First I have to get through tomorrow. It may sound like I’m being dramatic, but I’ll be honest, there have been tears. If nothing else in the world is certain, one thing is: I was not meant to be a personal shopper or a personal stylist when I grow up. I can rest assured that it’s a good thing I didn’t choose that path. This room I’m sitting in is full of bags of clothing and I’m afraid to even add up the receipts at this point. I still don’t know what I’m going to actually put on at 5am tomorrow. One person on twitter suggested I paste leaves to myseful. It comes as a close second to a white or black garbage bag I’m considering. So fingers crossed for me, will you? 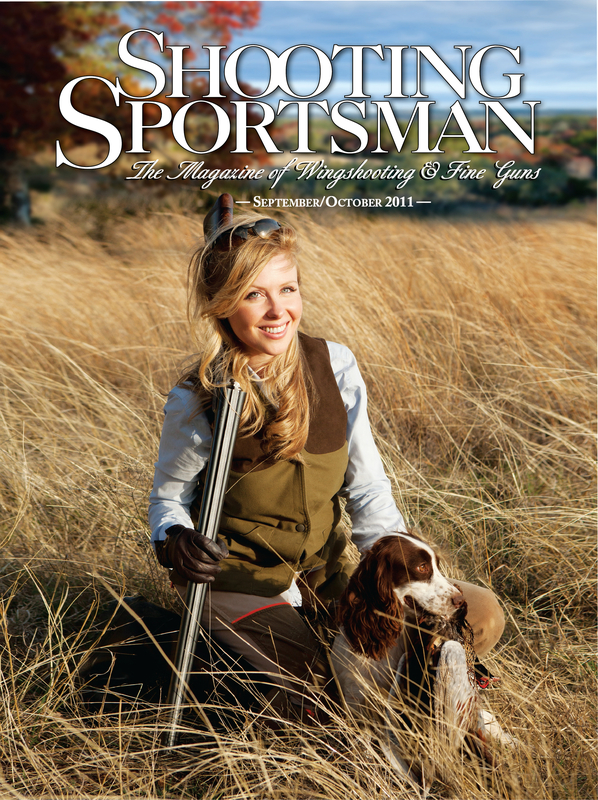 I’m currently on the cover of Shooting Sportsman Magazine for their latest issue. I’m flattered to be the second woman they’ve ever had on their cover and I’m hoping they do more of it. You may remember the post I did in the spring about the experience of shooting this cover in Texas. It was a grand ol’ time and I’m counting on tomorrow being the same. Terry Allen is the photographer and he is wonderful and lovely and patient and funny and all good things. I love hanging out with him. He took about 1.2 million photographs over the course of 3 days and this is the one they decided on. I have no idea how they decided. I couldn’t decide and got bored after looking at the 1,000th picture of me so I went and ate an ice cream cone and let them decide. So if you see it on a news stand near you, you can know that’s me saying hi and smiling at ya. Okay, I’m off to sort through shopping bags… or go find some leaves in the woods. Oh how I’d love to do your shopping for you…. I could do the shopping and you could do all the outdoorish stuff. Deal?? The cover looks fabulous. So excited for you. CONGRATULATIONS!!! an oh my heck aren’t you so cute!! You’re gawgeous girlfriend! And I’m with you about the shopping thing. It sends me into fits of despair like nothing else. Ugh. You are so beautiful! Love it! The shopping thing? Yeah, I hate it too. Wear what you wore on the magazine cover – you look gorgeous! Oh, I love this Georgia! You look stunning. And I bet even more with leaves glued to you. 🙂 do it! LOVE this – well done you – is that your dog? You look gorgeous and ready to shoot birds! Did I tell you about my one and only shooting experience – I won a trophy! Haha, no you didn’t tell me about it. I bet you’re a great shot, many women are. That is not my dog unfortunately, but I used to have that exact same dog. His name was Humphrey and he lived until about 14. Springer Spaniels are so beautiful. Congrats!!! And, um, you’d look stunning in a trash bag. Dang lovely cover/photo Georgia! and congrats on the book and magazine. Georgia, You are the most beautiful thing that ever graced a shooting vest. I’ve been fortunate to hunt Pheasants in South Dakota, Quail in North East Missouri, Dove in the Cut Sunflower Fields of Southern IL & Mallards in the Cypress breaks, Flooded Timber & Rice Fields near Stuttgart, AR. but I’ve never seen such a gorgeous face as yours carrying a fine Side by Side with a Spaniel at her feet. I’m jealous of your boyfriend/husband. Please remind him just how fortunate he is. Love it, Georgia! I am in Cooperstown all week (where I am from) if you happen to be this far upstate! 🙂 I am sure your book cover will be fab! Georgia you are positively gorgeous no matter what you wear, but this cover captures you perfectly!!! I love it!!! Can’t wait to see it so I can pick one up! I am totally on the look-out for the mag. You look fab! Amazing! Love it.You are radiant, graceful, and truly commanding! Bravo. Georgia – congratulations! You look beautiful …as always! I’ll be on the hunt for a copy. Congrats, Georgia, and best of luck on the cover shoot! I’m looking forward to hearing more about the German woman and the mansion, so be sure to fill us in once you things settle down for you. Simply gorgeous! A brilliant & beautiful woman with a finely crafted shotgun, nothing better! Just use this photo for the Girl Hunter cover 🙂 I’m sure tomorrow will go great! Amazing looking cover. I’m sure the book cover will be equally as awesome! Nice side by side. I used to have a springer as well. Name was Jethro and Ive never had a better dog before or since. Congrats on the cover Georgia!! You look amazing!! LOVE your cover, love your beautiful smile! Getting to know you through you blog has shown me that you are stunning inside and out! Looks wonderful congradulations. I honestly can’t wait for the new book. I am gearing up for my first bowhunting season this fall and will definately be needing it for some wonderful game recipes. I read in one of your earlier posts that you are right handed and left eye dominant. I recently found out that I am as well. I switched to left handed bow shooting and it’s done wonders but I’m still a little nervous to try with the shotgun yet. Do you still shoot right handed? Any tips? Prodded by the southern ways that are engraved in my character and ever present in my blood, I am conditioned to recall my gentlemanly manners prior to speaking or offering compliment. Thus, I hope I am not too bold when I say that today as I glanced at this recent issue of Shooting Sportsman, I was brought to a halt and taken back by your striking beauty and graceful features… that said, I admire your writing style and descriptive detail that only a true sportsman, an individual with a reverence and appreciation for the splendor in nature, could convey. You have a true talent…one to be admired and applauded. Your cover shot is gorgeous!! I hear you with the shopping. I had to do the same thing for my cover shot and it completely stressed me out. After much thought, I walked into J.Crew and told them to dress me. I paid full retail for everything, but I didn’t care. Someone was there to help! Thanks : ) I think it worked out okay… I just brought a million things and let the photographer decide. But I learned my lesson for the future, I’m in awe of people who do it for a living. That cover will get you quite a few unsolicited marriage proposals and the article will help sell your up coming book. Well done ! Hmmm… shirtless photos? Sounds pretty sketchy. Unless they had “will you marry me” written on their chests I would have to say no.